Stuart Hutchinson studied at the Royal Academy of Music, graduating with six prizes, diplomas and an Honours Degree. He was honoured in 1981 by the Incorporated Society of Musicians with their Young Artist Award. As an advanced student on the Royal Academy of Music Opera Course, Stuart studied with the distinguished coach Norman Feasey at the Royal Opera House, Covent Garden. He also became accompanist for the classes of distinguished vocal teachers Marjorie Thomas and Flora Nielsen. Stuart Hutchinson is in demand as accompanist and coach to many leading British and International singers - recital engagements have included London's Wigmore Hall, Queen Elizabeth Hall and Purcell Room, BBC Radio and Classic FM - with singers including Kathryn Harries, Joan Rodgers, Anne-Marie Owens, Jean Rigby and David Wilson-Johnson. 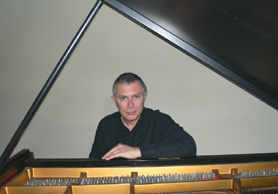 In master classes he has been accompanist for Dame Janet Baker, Gerhardt Husch, Renata Tebaldi and Pierre Bernac. Stuart has held the posts of Head of Music and Chorus Master for the Buxton International Opera Festival, Dublin Grand Opera and Wexford Festival Opera. He has also worked on the music-staff of English National Opera, Opera North, Opera 80, New Sadler's Wells Opera and the Wagner Society. He continues to coach privately in London and Sussex. From 1986 to 1990, Stuart was Music Director, subsequently Artistic Director to Morley Opera, at Morley College (London). Productions were staged in London theatres and at the London International Opera Festival. In a career spanning more than twenty-five years, Stuart has maintained a regular commitment to teaching and working with young students – National Youth Music Theatre, Year-Out-Drama (Stratford-upon-Avon College), Rose Bruford Opera Studies BA Course (Visiting Lecturer), Mountview Theatre Academy (Tutor) and the Royal Academy of Dramatic Art, etc.